There's a dreadful ailment that afflict superhero movies: the villain overload. Movies about costumed crime-fighters seem to attract surplus villains, like barnacles. Is it because the merchandising people want more toys to market? Or because they just want to pad out the cast with a few more names? It's hard to say. But the "too many villains" problem is still afflicting superhero films, as Green Lantern proved. And some people are worried the same blight will affect The Avengers and The Dark Knight Rises, two of next summer's most anticipated films. The good news is, a movie can overcome the problem of excess villainy. Here are some ways that superhero movies can escape from the death trap of having one or two villains too many. The truth is, there's no strict formula where the quality decreases as the number of villains goes up. Christopher Nolan managed to prove, in both of his first two Batman films, that you can have more than one villain in a film and still make it work. So even if The Dark Knight Rises has every villain it's rumored to have, including Bane and Catwoman but also Talia, Ra's Al-Ghul, Hugo Strange and Scarecrow, it could still be a great film. Likewise, we still have a lot of trust that Joss Whedon can make whatever arrangement of "Loki plus other villians" The Avengers has into a successful mixture. But still, it's hard to dispute that many of the crappiest superhero movies have followed the "supervillain team-up" formula. Having more than one villain in a superhero film takes the focus away from the hero(es), and then either you need two or three climaxes in which the hero fights the different villains, or you need some kind of tag-team deal, like Spider-Man 3 had. Having two supervillains often means that you need to have two supervillain origin stories, which is often dreary. But also, scenes were supervillains talk to each other are often really dull — you have two or three marquee actors wearing insane dayglo costumes, standing around on a soundstage full of dry ice and declaiming to each other. The idea of a "supervillain team-up" is something that DC and Marvel have done some great stories about, in their comics — but it's hard to make it work in the big screen. Most of all, when you have a giant cloud of fear energy plus a mutated scientist in the same movie, it's hard not to have the feeling of an overstuffed goose. You get the feeling that some studio exec someplace was piling up action figures on his plush office carpet, and insisting that if one villain was good, five had to be better. Let's pull out all the stops — it works for Michael Bay! Pick just one villain. Seriously. This is the easiest, best fix for the problem. Iron Man 2 would have been a better film with just one villain. So would Green Lantern and Spider-Man 3. It wouldn't have fixed everything that was wrong with those films, but it would have gone a long way. It's not the number of villains, it's the number of stories. There's a limit to how many subplots your average movie can contain, especially subplots which are about the villains of the movie. In the end, the antagonists of the movie have to tie into the main storyline, and there has to be one of those. So if there's more than one villain, the villains still have to work together as part of the central story, thematically and from a plot standpoint. The Dark Knight does this brilliantly, by making the Joker's effect on Harvey Dent a central part of the film's arc. It's the hero's story. 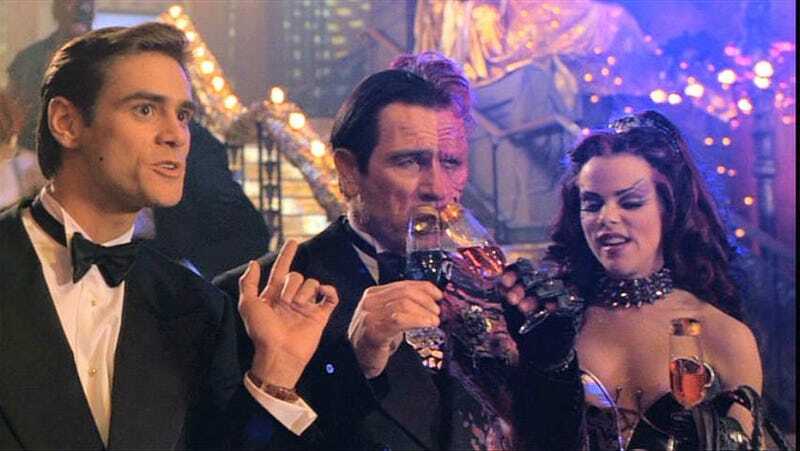 Actually, The Dark Knight pushes this principle almost to its limit, because it's as much about the Joker and Harvey Dent as it is about Batman. But it's still very much a movie about Bruce Wayne's journey and how these other two men affect him, and his view of his role as savior of Gotham. In general, in most superhero movies, the antagonists are there to force the hero to make choices, and rise to their challenges — and multiple villains still have to work as part of the hero's main story. Supervillains don't talk like supervillains to each other. Okay, seriously. Dialogue between supervillains should probably be kept to a minimum in the first place — but to the extent that the supervillains put on a crazy persona to intimidate their opponents, they probably act somewhat differently among their own kind. (A lot of my favorite comics of the past decade have shown this brilliantly.) Supervillains, when they're alone together, talk more like regular people and less like caricatures. Each villain is a different lesson. This is another way to go — it's a bit of a cliche to say your enemies are your best teachers, but it's still definitely true. And if you're going to go having more than one villain in a film, then each villain ought to be teaching a different lesson — or at least, a different version of the main lesson. Maybe there are different weaknesses that each villain plays on — or different wrong-headed ideas on the hero's part that each villain represents. We'd love to see more villain cameos. On the other hand, there's something great about showing that the superhero exists in a world where there are tons of villains all over the place, and he/she is constantly getting into random fights on the way downtown. This is something that comics do, which the movies have never really tried — it would be kind of cool if a superhero film featured a random fight with a supervillain, in the opening sequence, or during a random lull in the action, and then that supervillain was never seen again in the movie. Just another day at the office. Make the relationship between the villains interesting. If one of them is just a henchman, then fair enough, I guess. If they have some kind of dysfunctional relationship, along the lines of Gail Simone's Secret Six comics, then so much the better. Rather than just having two villains who are introduced separately and then decide to team up in time for the third act, or just randomly come together, having a more interesting dynamic between them will go a long way towards making them work as characters. Each villain should want something. Just like every hero should. And it shouldn't just be "to wear a cool costume and be ebil." Ideally, at least someone in the movie should want something more interesting than "vengeance on the hero for some hand-wavy reason."